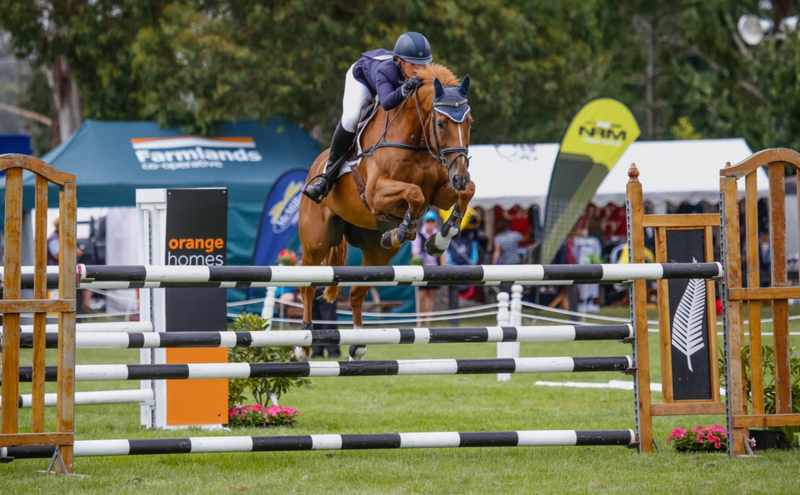 The National age and rider series titles were up for grabs at the NRM National Jumping and Show Hunter Championships on Saturday 10th February, as well as the annual National Horse Derby title. 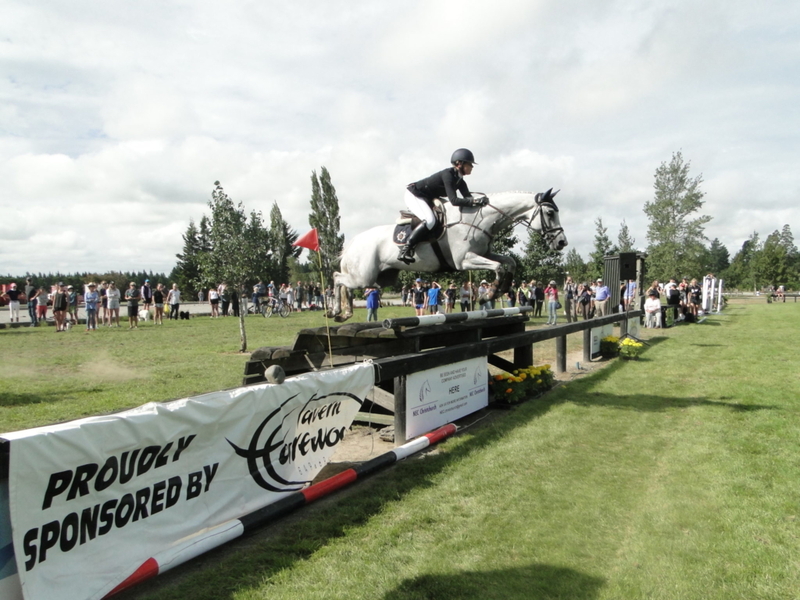 It was an action packed day full of many exciting jump offs and finished with the thrilling derby incorporating McLean’s Island’s cross country course. The day belonged to eventer/part-time show jumper Kirsty Sharapoff and her clever steed Shot The Breeze. 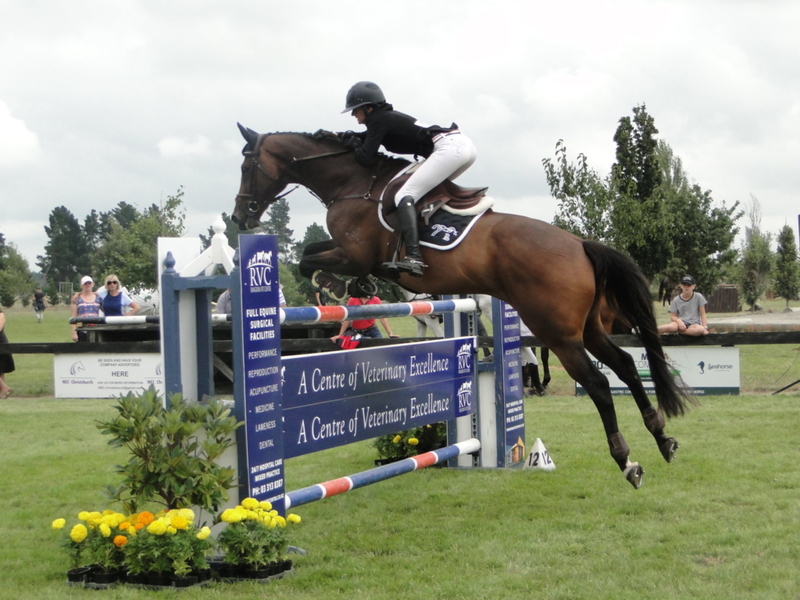 Early in the day they made a six way jump off in the Dunstan Horsefeeds & Equifibre Pro Am in association with Moa. Birthday girl Tamara Silcock set an impressive benchmark aboard Steel Magnolia going clear in 39.69 seconds. Sharapoff had the advantage of being further down the draw and executed all the inside turns to finish in 38.91 seconds. She not only claimed the title, but a winners dress rug and a cold Moa Magnum. 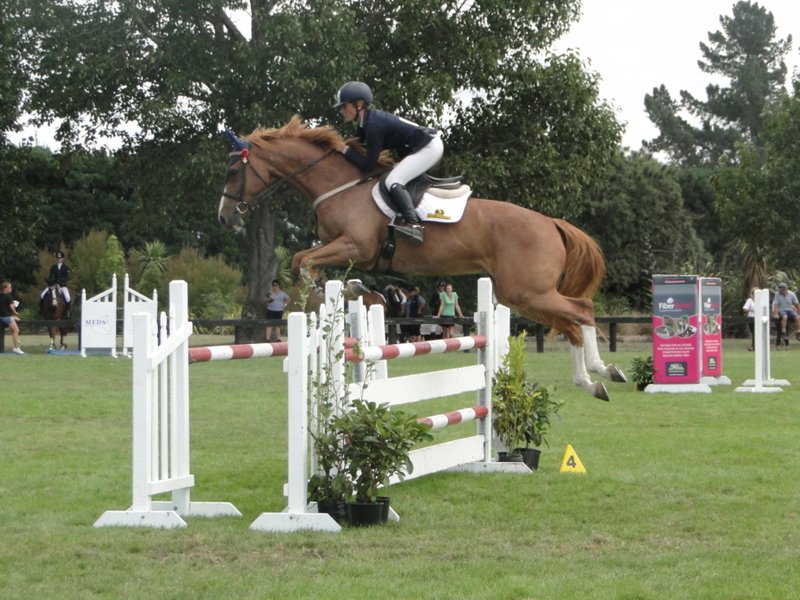 The Dunstan Horsefeeds & Equifibre Junior Rider with equitation in association with Leg Up Performance Oil provided another competitive jump off. All riders put their foot down and many paid the price when the rails fell. Lucky last to go Steffi Whittaker riding Katie O’Neil’s Tribute OL sat in an advantageous position knowing she only had to go clear. That’s exactly what she did finishing with the slowest jump off time, but the all important only clear to take the win. Sophie Townsend and Kingslea Kiwi were bridesmaids once again as the fastest on four faults. The two riders swapped positions when it came to the equitation placings, with Townsend’s wonderfully ridden first round coming out on top. 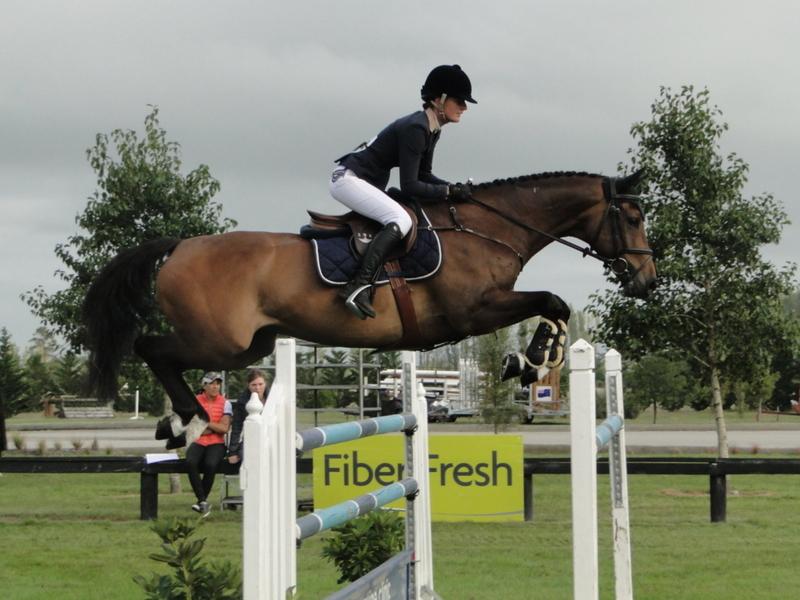 Lucinda Askin carried on her winning ways in the FMG Young Rider in association with Rangiora Vet Centre. Just Askin aboard Portofino and Todd Magner aboard Awatuna Jonesy made it through to the jump off over a challenging course set by Australian designer John Vallance. Out first, Askin produced an efficient clear round taking inside turns to stop the clock in 40.79 seconds. Magner followed to carve five seconds off her time, but unfortunately had one rail in the process to hand Askin the win. There were three double clears in the Caledonian Holdings Amateur Rider in association with Lone Goat Vineyard. The first came from Southlander Jessica Fahey and Repertoire ll, who set the benchmark in a speedy 44.54 seconds. The closest anyone could get was 49.27 seconds gained by local Carissa McGregor and Blytheburn Coruba. 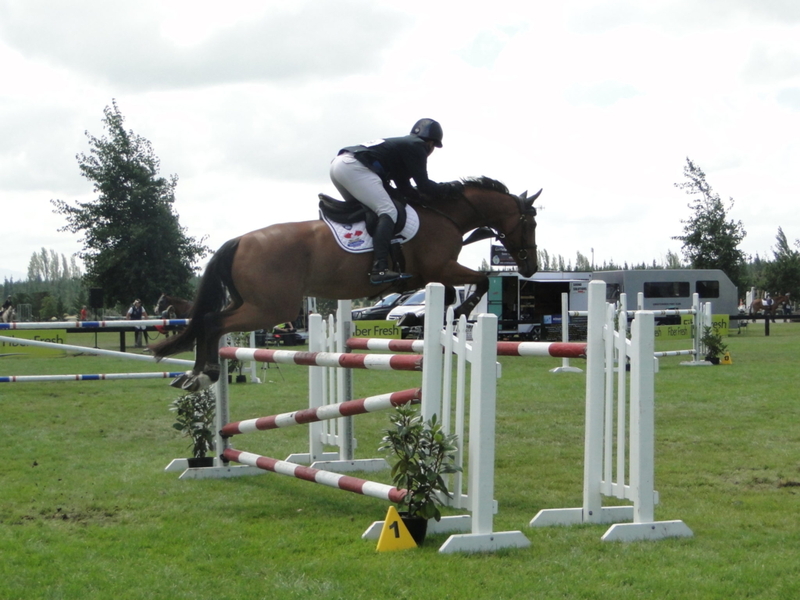 Helen Ensor from the other end of the Island in Blenheim achieved the last double clear finishing in 50.06 seconds claiming third place. Tegan Fitzsimon and Windermere Cappuccino continued their dominance in their age group winning the Purepine Shavings 7 year old in association with Platinum Performance. The combination were an obvious winner eight faults ahead of second and third place getters Dani Maurer on Le Bam and Georgina Dormer on Bravados NZPH. This also achieved quite a feat for the horse as Windermere Cappuccino has now won the 5, 6 and 7 year old National titles. Five up and coming stars made it through to the jump off in the Mitavite 6 year old all jumping double clear. A cheeky inside turn saw Dormer achieve a great time of 36.31 seconds on Cassanova NZPH. She looked too hard to beat until Harry Feast came out last to go. On Double J Barman he pulled off an unimaginable turn and angle to slice just over two seconds off Dormer and steal the win. It was also a great jump off in the East Coast Performance Horses 5 year old in association with NZ Horse & Pony Magazine. Three out of six jumped off clear and the fastest came from young rider Sophie Scott and Glenbrooke All Roses to claim the National title. Olivia Brown was wrapped with RH Royalty to finish less than a second behind in the horse’s first time jumping 1.15m. Sharapoff topped off her day with a well deserved win in the Tavern Harwood NZ National Horse Derby Championship for the second year running. She looked to be heading towards the only clear of the competition when sadly the last rail fell. However she had done enough on course over the challenging cross country jumps to have enough time in hand that she still won with the added four seconds. Silcock and Steel Magnolia once again finished second recording a slightly faster time, but added eight seconds to her time when rails rolled off the cross country jumps. It was an exhilarating end to the day for the crowds who came out to watch the action. 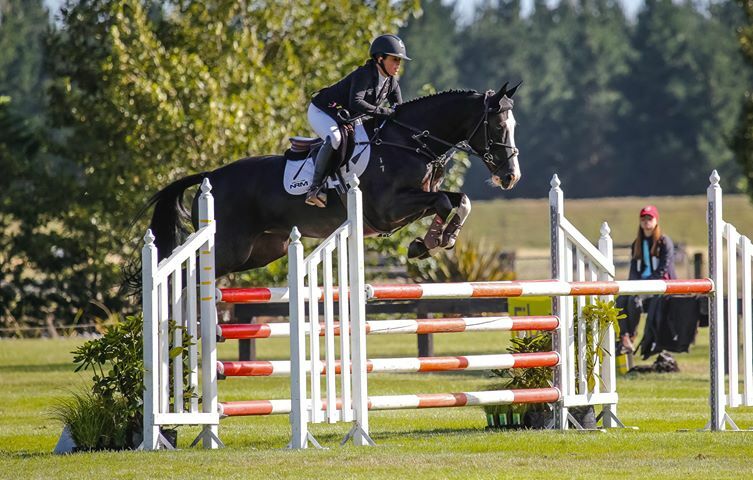 FMG Young Rider in association with Rangiora Vet Centre: Lucinda Askin (Ashburton) Portofino 1, Todd Magner (West Coast) Awatuna Jonesy 2, Steffi Whittaker (Springston) Ngahiwi Cruise 3, Grace Percy (Glenorchy) Kiwi Spirit 4, Kimberley Bid (Ashburton) Cera Cassina 5, Olivia Brown (Dunedin) RH Kukumoa 6. Dunstan Horsefeeds & Equifibre Pro Am in association with Moa: Kirsty Sharapoff (Christchurch) Shoot The Breeze 1, Tamara Silcock (Nelson) Steel Magnolia 2, Angus Taylor (Ohoka) Oak As 3, Abby Hore (Millers Flat) Beaumont Geldolf 4, Gail Richardson (Invercargil) Eirann Bandola 5, Devon van Til (Woodend Beach) Winterberg 6. Dunstan Horsefeeds & Equifibre Junior Rider in association with Leg Up Performance Oil: Steffi Whittaker (Springston) Tribute OL 1, Sophie Townsend (West Melton) Kingslea Kiwi 2, Rebecca Wardle (Hokitika) WS Paradise 3, Grace Manera (West Melton) Vittoria 4, Sophie Scott (Wellington) Benrose Rockstar 5, Rosa Buist-Brown (Burnham) Prestige 6. Dunstan Horsefeeds & Equifibre Junior Rider in association with Leg Up Performance Oil Equitation: Sophie Townsend (West Melton) Kingslea Kiwi 1, Steffi Whittaker (Springston) Tribute OL 2, Rosa Buist-Brown (Burnham) Prestige 3, Grace Manera (West Melton) Vittoria 4, Tayler Nalder (Cust) Icebreaker ll 5, Sophie Scott (Wellington) Benrose Rockstar 6. Caledonian Holdings Amateur Rider in association with Lone Goat Vineyard: Jessica Fahey (Invercargill) Repertoire ll 1, Carissa McGregor (West Melton) Blytheburn Coruba 2, Helen Ensor (Blenheim) Zactac Carnival 3, Claire Lewis (Hawarden) Ruweisat Ridge 4, Emma Pilcher (Blenheim) Snazzy As 5, Jessica Sonne (Christchurch) Summer Haze 6. Purepine Shavings 7 year old in association with Platinum Performance: Tegan Fitzsimon (West Melton) Windermere Cappuccino 1, Dani Maurer (Auckland) Le Bam 2, Georgina Dormer (Christchurch) Bravados NZPH 3, Amanda Roy (Gore) Cazette HSH 4. Mitavite 6 year old: Harry Feast (West Melton) Double J Barman 1, Georgina Dormer (Christchurch) Casanova NZPH 2, Rosa Buist-Brown (Burnham) Vali 3, Rose Alfeld (Leeston) Cadenza NZPH 4, Kate Cavanagh (Geraldine) Wallflower 5, Sophie Scott (Wellington) Glenbrooke Centarose 6. East Coast Performance Horses 5 year old in association with NZ Horse & Pony Magazine: Sophie Scott (Wellington) Glenbrooke All Roses 1, Olivia Brown (Dunedin) RH Royalty 2, Sonia McKerchar (Kurow) Desire NZPH 3, Harry Feast (West Melton) Double J Barista 4, Sophie Scott (Wellington) Glenbrooke Rich As Roses 5, Katie Meredith (Ohoka) The Prosecutor GNZ 6. Tavern Harwood NZ National Horse Derby Championship: Kirsty Sharapoff (Christchurch) Shoot The Breeze 1, Tamara Silcock (Nelson) Steel Magnolia 2, Brodie Roberts (Rangiora) Playmaker 3, Sophie Scott (Wellington) Benrose Rockstar 4, Lydia Truesdale (Christchurch) Allander Rocket 5, Rebecca Wardle (Hokitika) WS Paradise 6.